Lady Jaye graduated from Bryn Mawr and did her graduate work at Trinity College in Dublin. She is an expert at covert operations, with a background as an accomplished actress and linguist. She can pass for a native in many nations, including France, Italy, Poland, Russia, Germany, Afghanistan, Spain, and Portugal. Although not one of the original Joes, Lady Jaye is nonetheless a prominent member of the team. Her skills as a personnel clerk make her one of the few people who can keep track of the growing roster of Joes, their various special assignments, and current assignment details. Her training is wide and varied, as befits a covert operations specialist. She is disciplined in a wide assortment of weaponry, from crossbows and javelins to rifles and machine guns. Lady Jaye is also Airborne and Ranger qualified, and graduated intelligence school at Fort Holabird. She has maintained a relationship with Flint, the Joe Team's warrant officer, although her professionalism and Flint's "attitude" have made for some occasionally rough edges in their relationship. Airborne and Ranger qualified, graduated intelligence school Fort Holabird. Qualified expert: M-16, M1911A1 and reflex crossbow. From General Hawk's Files: "Because of the nature of her specialty, that of covert operations, Lady Jaye doesn't always work well within a team environment. She is, however, a consummate professional, she is the best at what she does. On those rare occasions during off-hours when she does let her guard down, she is a remarkably friendly and pleasant person." Snake-Eyes' life has been one of both military discipline and horrific tragedy. He served in Southeast Asia in a Long-Range Recon Patrol. Upon returning home, he learned that his parents and sister had been fatally wounded on their way to the airport to meet him. 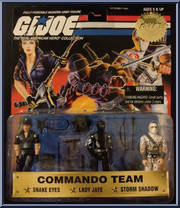 Subsequently, Snake-Eyes joined the ninja clan which was Storm Shadow's family. This ended in disaster when the head of the family, known as the Hard Master, was assassinated. Storm Shadow was the primary suspect. Later, Snake-Eyes would retreat to a mountain cabin in the High Sierras, turning his back on the world, with only a wolf named Timber as his companion. When the G. I. Joes were being formed, Stalker and Hawk brought him back to be part of the team. In an early Joe mission, Snake-Eyes was involved in a mid-air helicopter collision that left his face horribly scarred. He was virtually unable to speak. Yet, through all of this, Snake-Eyes never abandoned his sense of duty or discipline. He remains, to this day, the ultimate soldier, and a valued member of the G. I. Joe Team. From Snake-Eyes' Journal: "Do I have any regrets about choosing the life of a soldier? None. It has been my continuing privilege to serve in defense of this country and for all it stands for, with men and women upon whom I can depend utterly. They are the finest this country has to offer. Being a soldier isn't so much a job-it is a trust." He also comes from a family of ninjas, whom he rejoined after serving his time in Southeast Asia. The head of the ninja clan, the Hard Master, Storm Shadow's uncle, was destroyed. The perpetrator was believed to be Storm Shadow himself. Storm Shadow knew otherwise, and took off in pursuit of the assailants. This eventually lead [sic] him to the terrorist organization known as Cobra. Storm Shadow infiltrated the organization, serving as Cobra Commander's personal bodyguard until he could discover the truth surrounding his uncle's death. It was ultimately revealed that the assassin was Zartan, on orders from Cobra Commander, and the intended target was Snake-Eyes. Storm Shadow was ultimately denied his revenge, but also realized that his drive for revenge had nearly consumed his soul. He turned his back on the evil that had nearly claimed him. He sought out his ninja brother Snake-Eyes, and eventually joined the G. I. Joes. From General Hawk's Files: "In his own way, Storm Shadow is just as devastating a warrior as Snake-Eyes. However, Storm Shadow seems to prefer more traditional, even ancient methods of combat, using the tools of the ninja as opposed to more modern hardware. Storm Shadow places a very high regard on personal honor, and is determined to make up for his time in service to Cobra. I'm glad he's on our side now!" Contribute pictures, update details or suggest corrections for Commando Team. Write a review about Commando Team.